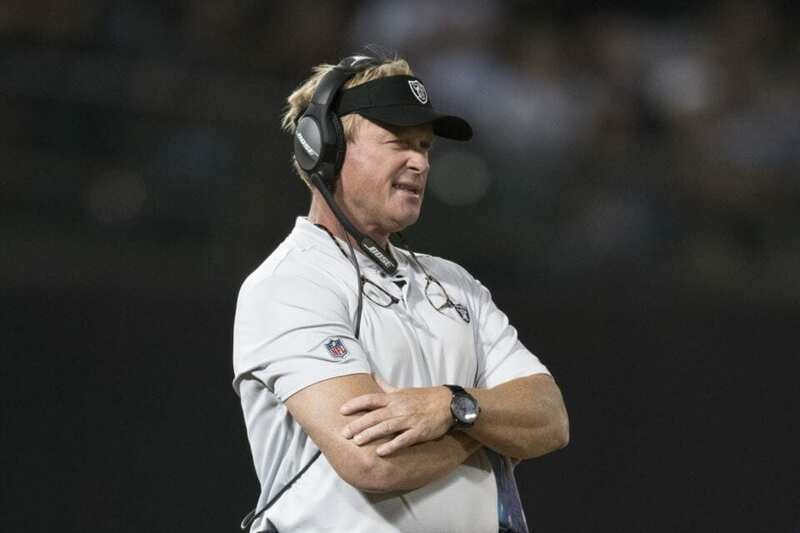 Since bringing back Jon Gruden to reprise his role as head coach, the Oakland Raiders have gone through a bevy of changes — both on and off the field. While general manager Reggie McKenzie was retained in the front office, the consensus is that Gruden was given equal, if not greater, input in regards to personnel decisions. An active offseason that featured plenty of roster turnover was capped off with the controversial trade of Khalil Mack prior to Week 1, reportedly creating a rift among some highly-regarded executives in the organization. But the manner in which he evaluates personnel — and the people who have his ear — has led to a disconnect in a Raiders building filled with people still trying to adjust to a new way of life. According to sources, Gruden essentially has his own staff that helps him judge talent and make decisions — most notably confidant and Director of Football Research Dave Razzano — along with a slew of interns and assistants. It isn’t surprising that there’s a bit of disconnect within the Raiders higher-ups, given all that has gone down since the beginning of the season. A recent report indicated that the front office was split on the decision to trade Mack and even more on the return it netted. Moreover, Gruden has been criticized for piecing together an older roster with the addition of many veteran free agents over the offseason. Now at 0-3, the Raiders will only find themselves under even more scrutiny until they get back to their winning ways.